I was looking at Moody Bible Institute's (MBI) website today, just seeing what they're up to these days. For those of you who may not be aware, in 2013 Moody's board of directors changed a century-old policy, no longer banning smoking tobacco, drinking booze and gambling for faculty and staff. Thus, I nicknamed MBI to “Moody Bible SINstitute.” It was shameful to hear one of Moody's top leaders rejoice that he'd been waiting 20 years to drink a cold beer and finally could. This is where America's Bible college's are at spiritually today! I thank God that I've never drank a drop of beer, and by God's grace never will. Having said that, I like some aspects about MBI. I like listening to their “LAW TALK LIVE” radio show featuring the Christian Law Association. It's really helpful advice. Unfortunately, MBI supports heretic John MacArthur who denies that Jesus' blood is on the mercy seat in Heaven. Moody publishes MacArthur's books. MacArthur is also a devout Calvinist, teaching that Christ only died for Christians (aka, Limited Atonement), and that Christians are not saved unless they persevere in holy living (aka, Perseverance Of The Saints). For more information refuting Calvinism, please read, “Why I Disagree With All 5 Points Of Calvinism” by Pastor Curtis Hutson. I read something on Moody's website that struck me as hypocritical. On their “Doctrinal Qualifications For Students” webpage they make the following statement . . .
How can a student believe in the “INERRANCY” of the Holy Scriptures when Moody supports hundreds of modern Bible versions which all say something different? 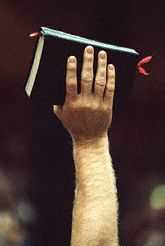 Moody allows and supports the plethora of never-ending modern Bible versions being published, which are all corrupted. Truly, the love of money is the root of all evil (1st Timothy 6:10). All of the modern Bible versions are copyrighted, so that the publishers can profit from the sale of THEIR BIBLE VERSION. It's not God's inspired Words. Our text verse says that we need “EVERY WORD” of God to live. That means I need an EVERY WORD BIBLE, and so do you. The New International Version (NIV) changed or removed over 64,000 words. The name of “Lucifer” is completely gone from Isaiah 14:12. This is the only mention of the word in the Bible. Let me ask you a question? If you only had an NIV and the King James Bible didn't exist, how would you ever learn about Lucifer? The answer obviously is that YOU WOULDN'T. Thank God for the trustworthy King James Bible!!! All of the following words in the King James Bible have been completely REMOVED from the NIV and New International Reader's Version (NIRV) . . .
...Sodomite, regeneration, mercyseat, Calvary, remission, Jehovah, immutable, omnipotent, Comforter, Holy Ghost, Messiah, quickened, infallible, fornication, trucebreakers, winebibbers, carnal, slothful, unthankful, effeminate, impute, backbiting, vanity, lasciviousness, whoredom, devils, Lucifer, damnation, brimstone, and the bottomless pit. If all you ever had was the NIV or NIRV to read and study, you'd be missing all of these important doctrinal and morality-related terms. I know large Baptist churches who use the poor excuse that they have over a dozen bilingual groups within the church body, who allegedly need the new “EASY-TO-READ” versions. What a big lie of Satan! That's like saying that it's better to jump out of a plane without a parachute because it'll get you to the ground faster. Such churches often use two Bible versions in the church (the reliable King James Bible, and then some new corrupt modern version alongside). Talk about confusing! But what if there were no King James Bible? All of the important words that I just mentioned would be non-existent. What a horrifying thought! The word “carnal” is gone! That's because Satan doesn't want today's apostate churches to know that God calls them “carnal” (see 1st Corinthians 3:1 in the King James Bible). The new Bible versions are dung! The words “brimstone,” “bottomless pit” and “damnation” are gone! There is hardly any preaching these days about eternal punishment in the churches. Hell is rarely, if ever, mentioned anymore. Our churches are lukewarm, professing to be hot in their icy spiritual condition. The word “unthankful” is gone. People these days are certainly very unthankful. Unbelievably, the translators of the NIV also removed the important word “Calvary.” Check all of the new Bible versions and you'll quickly discover that they're all in the same satanic boat. My friend, if there were no King James Bible, we'd all be in a heap of trouble. I know many churches total, even Independent Baptist Churches who used to be amongst the best, who elevate fellowship, talent, and ministry growth over the integrity of God's Word. Many of them claim to prefer the King James Bible, while at the same time hobnobbing with the Devil by using the new corrupt so-called “Easy-To-Read” Bible versions. Shame on any pastor who has been warned about the new Luciferian Bible versions which attack Christ's deity, remove the word “Godhead” completely, diminish the preeminence of Christ by changing every mention of somebody worshipping Jesus to knelt, and by removing key theological terms in the Word of God. Sadly and tragically, the truth is being censored in today's churches, including our Independent (no longer fundamental) Baptist churches. Thank God for the King James Bible, which was translated long before the Masonic, Luciferian-worshipping, evil occultists of the 19th century plotted to infiltrate the churches through corrupt Bible versions. The question is have you been deceived? Does your church use some corrupt version besides the reliable King James Bible? God only wrote ONE BOOK, not hundreds! The very fact that churches cannot theologically survive anymore without the King James Bible, because today's new versions are so lame and corrupt, says it all. There is nothing more important in this world than the truth. Today's churches are far more interested in not-offending their congregations, so they won't lose financial support. It's usually a small handful of rich people that control each church, but it shouldn't be that way. The two great dangers in churches today are the false plan of Lordship Salvation, and the modern corrupt Bible versions, both of which are totally of the Devil. It is tragic that many pastors refuse to take a stand, because they are cowards, hen-pecked, set in their apostate ways and not right with God. It is a big joke for Moody Bible Institute to require students to believe in an INERRANT Holy Bible, when the school uses, allows and supports all of the modern satanic Bible versions. Honestly, Anton LaVey's 'The Satanic Bible,' is as much God's Word as the new Bible versions. I'm talking about the satanic New International Version (NIV). I'm talking about the demonic New King James Version (NKJV), which is translated from the same corrupted Alexandrian manuscripts as the NIV. I'm talking about the satanic English Standard Version (ESV). I'm talking about the satanic new work of darkness of the Southern Baptist Convention, aka, the 'Holman Christian Standard Bible' (HCSB). I'm talking about the New American Standard (NAS) and the Revised Standard Version (RSV). I mean it when I say that Anton LaVey's 'The Satanic Bible,' is as much God's Word as the new Bible versions. THEY'RE ALL FROM HELL!!! We need to get rid of most of today's pastors and replace them with genuine men of God who elevate and prioritize THE TRUTH above everything else. I don't care how successful you think your big church is, you are a total failure in God's eyes and a very bad church if you use and support the modern Luciferian Bible versions. All modern versions come from a DIFFERENT Hebrew and Greek source than the King James Bible does. Here's a helpful chart of the origin of today's versions and the King James Bible. Bless God, there is only one good Bible in the English language available today, and that is the good ole King James Bible. If it weren't for the precious King James Bible, we'd never learn about “Calvary.” Modern Bible versions completely remove the word Calvary, which is mentioned only once in the trustworthy King James Bible in Luke 23:33. Calvary is gone, gone, gone in today's PERverted Bible versions, like the New International Version (NIV). They ought to call it the H.I.V. Bible! Today's corrupt Bible versions have lost all their authority! Thus, the churches have lost their authority! The King James Bible is authoritative!!! Amen. Today's wimpy preachers couldn't preach their way out of a wet paperbag! It's because of the PERverted, wimpy, corrupted, new Bible versions. I'm talking about ALL OF THEM! All of today's versions attack Christ's deity! Thank God for the King James Bible. What a horrifying thought if we didn't have the precious, proven, time-tested and reliable King James Bible!